The original bathroom had been remodeled by previous owners, cheaply and without permits. They had moved the toilet and used the space to create a small shower. They kept the ugly original 1970s color scheme and 14-foot sloped open-beam ceiling. There was no way to update the bathroom and enlarge it without completely gutting it and adding adjoining rooms (a small walk-in closet and the powder room). 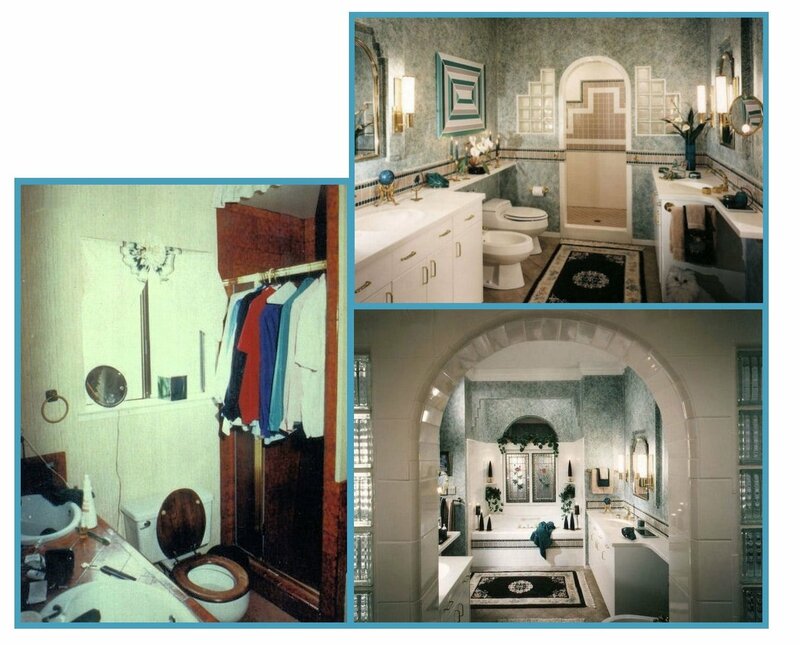 The 1970s master bath achieved best contemporary function and appearance! It’s now 8’ x 15’ with room for a two-person hydrotherapy whirlpool tub, two six-foot European-style lavatory cabinets (loaded with storage accessories), a two-person tiled shower, a toilet and a bidet, and unique “terry cloth” walls that make the Homeowners happy. Yes, it’s achieved Best Function + Appearance!